The right technology makes us more efficient, allowing us to accomplish more in any given day. High productivity adds to the bottom line, just as low productivity takes away from it. Keeping systems optimized for performance and updated for security patches ensures your technology is working for you instead of against you. 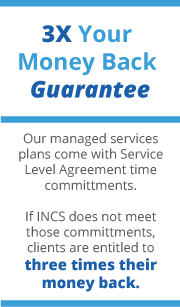 Our team of professionals at INCS will proactively manage your systems, even if it means working during late night hours, to keep your team functional all day, every day. You might have noticed that as computers age, they tend to slow down. While nobody likes spending money on things like plumbing, car tune ups, or even new household appliances, we understand that eventually everything needs to be replaced. Equipment refresh programs helps our clients manage replacements in a way that is much less painful to their budget, bottom line and productivity. How you select and support your industry-specific applications also is crucial to your team’s productivity. Billing and office suite standardization is equally important, as is getting answers when your team needs them.